TAG Racing are proud to announce that Dan Linfoot and Shaun Winfield have both agreed one year deals to ride for the Derbyshire based outfit during the 2019 Bennetts BSB Championship. Following a tough year for the 2017 runners up after only one visit to the podium with James Ellison, the team are now fully focused on putting a difficult campaign in 2018 behind them and focussing on the future. Dan Linfoot joins TAG Racing after a tough season with Honda Racing, which was blighted by injury and bad luck. 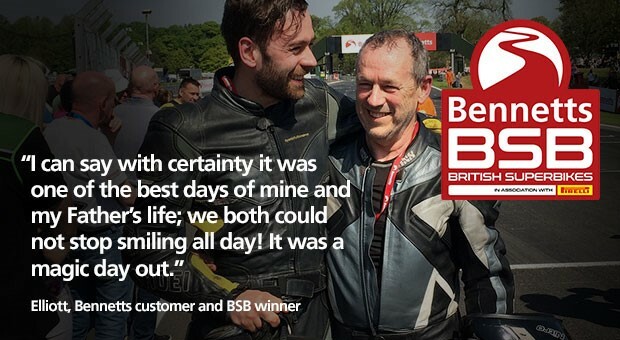 A winner in Bennetts BSB, and a former ‘Showdown’ contender, Linfoot is excited by the challenge that 2019 will bring. The Yorkshire man has fully recovered from a bruising season and is eager to get going ahead of an exciting 2019 for him, and the team. Shaun Winfield stays with the team once again after his most successful season in the series. The 25-year-old collected his greatest ever amount of points and progressed into Q2 for the first time in his short Superbike career, aswell as achieving 100 races in Bennetts BSB. After signing the deal Dan Linfoot said: “I’m really happy to have signed with TAG Racing and Rob Winfield. 2018 has been a disastrous season for me so I’m really happy to have agreed a deal for 2019 with a new team, providing a new challenge and a new feeling on a different bike. Hopefully we can have success this season and both get back to the results that we know we are both capable of. Teammate Shaun Winfield added: “I’m over the moon to be staying in the Bennetts British Superbike class for 2019 and after this season I’m more excited than I ever have been. My results improved vastly from previous years in 2018 and that is something I’m looking to build on. “I have been extremely lucky in the last two years to have had Josh and James as my team mates, I learnt a lot from them not just on the track but off the track too and to now have Dan on the opposite side of the garage I’ve once again got someone I can soak up advice from to better myself. “What is even more exciting is that Chris Walker will stay with me, last years success was mainly down him and the way he helped me certainly didn’t go unnoticed so I’m expecting more of the same in 2019. Finally, Team Owner Rob Winfield summerised: “We’re delighted and proud to announce that both Dan and Shaun will ride for the team in 2019. As a team we are under no illusions that next season will be easy, because it won’t be, some teams have improved vastly, and it will be very difficult, but as most people are aware, we love a challenge. The team now have an extensive testing programme in place ahead of the new season, with tests planned in Spain in the new year.